What is select & copy behavior? Why is select & copy behavior important? Select & copy behavior is an important metric for digital teams to measure. By combining it with different metrics like focus time, pages viewed, and so on, they can gain invaluable insights into customer behavior and optimize their sites accordingly. For example, though not associated with particularly extreme engagement or frustration, select & copy behavior is a key indication of a customer’s interest. It's commonly associated with comparison research: a user copies a product name or number to see if they can find a cheaper or more convenient deal elsewhere. Such instances of select & copy behavior therefore represent good opportunities to present personalized communications, like discount codes for example. For one of our international publishing clients, meanwhile, select & copy behaviors surfaced an issue with the translation of the language of their on-page content. They were alerted to multiple sessions in which users were copying vast swathes of text, losing focus, and switching tabs. This indicated that users were copying text to then manually translate its language themselves on an external site – not an ideal user experience. These insights led to a quick fix. Being alerted to select & copy behavior also has useful application in cases of fraud. Within Decibel Insight, alerts can be customized to trigger on, say, web or app pages that contain sensitive personal information. This functionality is utilized widely by clients who handle sensitive customer data. 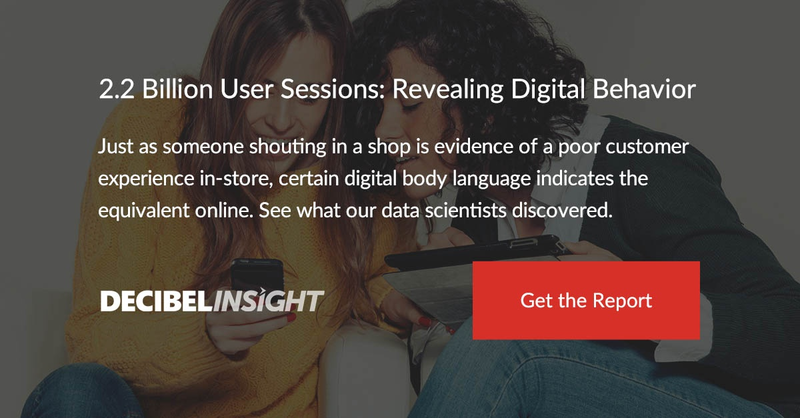 To learn more about select & copy behavior - and other digital behaviors that denote user sentiment - download our full report on digital body language below.